Hello and welcome to my blog; today I am going to share with you this cute little home decor piece that I made for my sister back at Christmas. She got married a year ago and I wanted to create a piece that she and her new husband could have around their house. 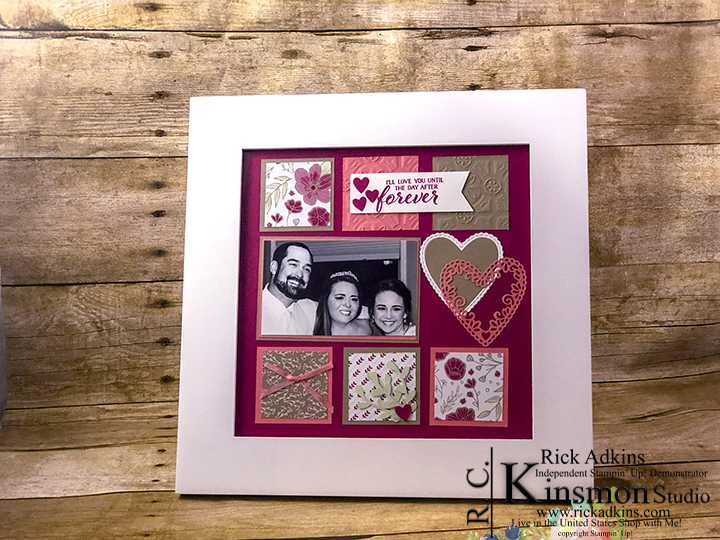 I used the products from the All My Love Suite to create this cute little piece. Here's a picture of the framed piece of art. I am using the Forever Lovely Stamp Set from the 2019 Stampin' Up! Occasions Catalog, along with some of the products from the All My Love Suite. These products are not are not only perfect for Valentine's Day, but for any occasion that represents love. So it was all perfect for this Sampler that features a picture from her wedding. The floral images and classic color combinations of the designer series paper make it perfect for any of these occasions.